First I say disclaimer to remove any doubts or fears anyone might have, because I know it comes up for some, because I use the word meditation. Because that’s what it is. But, let’s separate the practice of meditation from a theology. Meditation has nothing to do with reaching or worshipping a peculiar form of Infinite Intelligence. Rather, like the human urge to seek divinity is clothed in different cosmologies and pantheons for humans in different epochs of time… Meditation is a method any human in the universal family discovers to deepen and mature spiritual contact. I’ve always liked what Joseph Campbell says in The Hero Of A Thousand Faces. He says it’s the same God who, because of cultural differences, the times, the ways they express, the tools they possess, express and create God differently. Bottom line, however, is meditation is a spiritual practice, not a religious practice, even when it is incorporated in the practices of a religion. 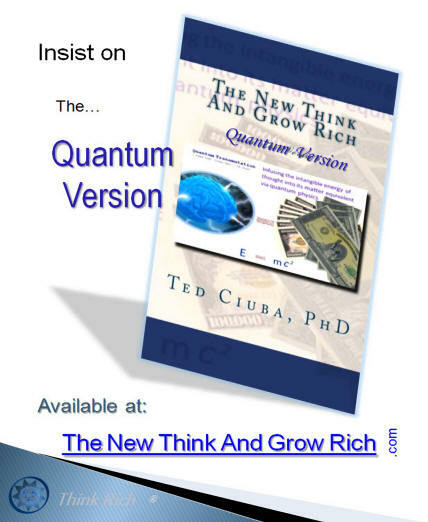 That being said, how to contact Infinite Intelligence, how to tie into that superior font of wisdom, ideas, and the answers and solutions you’re looking for is described very well in The NEW Think And Grow Rich in the case study of Dr. Elmer Gates. Elmer Gates had in his laboratory – because, remember, he was a working thinker – a room off to the side in which nobody ever disturbed him in. The door could be shut and the curtains could be drawn so it approached pitch black. And he sat comfortably in an upright position at his desk. He had writing materials always there, fresh pens, fresh tablets, because he was going to enter meditation and was going to wait to receive from Infinite Intelligence, from HoloMagic, have it happen, and receive tangible ideas he could use to benefit humanity, his clients, and himself. He would first form a vivid vision of the intended outcome, reminding and impressing himself, his subconscious, and HoloCosm. He would then call up the known aspects of the working laws and what he had (that he knew of ) to work with…. He would then stand by. In that elevated space, in the tension established between the finished invention and the “actualities of the day,” the starting point, so to say, HoloCosm began to deliver the means to complete and produce the invention. To flash ideas into his mind in connection with the unknown, connecting factors of the invention. Again you see a form of meditation in motion. On one occasion ideas came through so fast he was forced to write for almost three hours. When the thoughts stopped flowing, and he examined his notes, he found they contained a minute description of principles that had no parallel among the known data of the scientific world. Moreover, the answer to his problem was intelligently presented in those notes. In this manner Dr. Gates completed over 200 patents, which had been begun, but not completed, by “half-baked” brains. Evidence of the truth of this statement is in the United States Patent Office. This case study proves you can set the conditions to have HoloMagic happen, to have Infinite Intelligence flow through your current outward into the world, and that’s what Elmer Gates did. And today… You may not be so elaborate as having a rotary dial or digital rocker to tune down the lamp, but wherever you are you can sit silently, tune in, make the connection. Once there, you draw the image of what the intended consequence is – the outcome, the invention, idea, or project doing the thing that you want. You must be very specific. Then, consider what you have to work with, what we know, what our knowledge will allow us to do. And feel the tension between where you are and where you want to be. That’s when and where Infinite Intelligence feels invited and responds. And there’s other ways to help facilitate this contact, too. A lot of people, myself included, like to use soft music, appropriate music. Nothing against Elvis Presley but that’s not the kind we use for meditation. Candles, incense, some people like to use incense. Certainly, pay attention to your lighting, to the extent you can. Tune in, make a connection, ask. And in that asking, consider where you want to go, where you’re starting from, let that tension settle in… Infinite Intelligence created you. 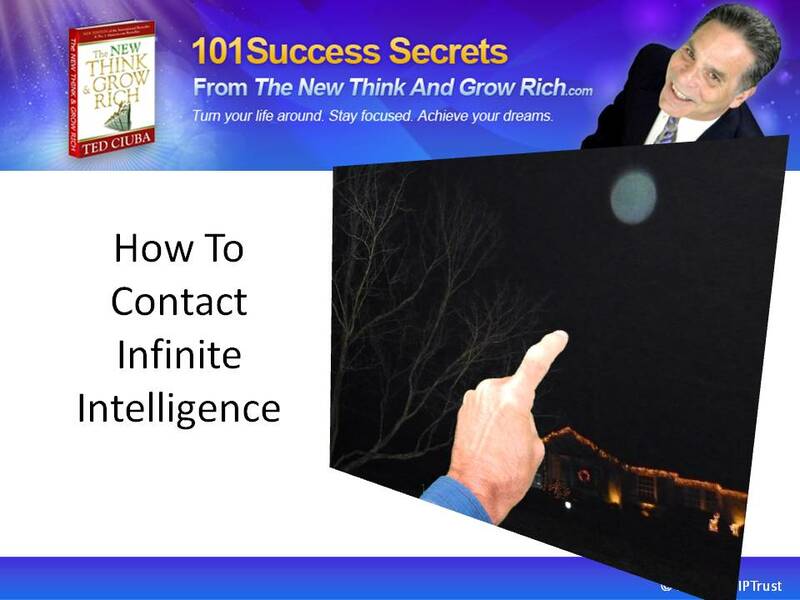 Infinite Intelligence made you just like E.T., and this is you phoning home. Now Infinite Intelligence communicates through you. Do be like Elmer Gates, and record your thoughts, inspirations, and directions. Even inspired thoughts can’t hold their substance in the rough winds of daily commerce, and will soon be unremembered. All those but the ones captured by the diligent hand. That’s the story of how you connect with Infinite Intelligence. You meditate it.